As it’s shown, Nfdump has 2 major elements: ‘nfcapd‘ which is a daemon to gather and store relevant packets and ‘nfdump‘ which collects packets from all the daemons and interprets them. Apparently, nfcapd and nfdump could run on different machines and there could be multiple daemons but in case of VMware vSphere, it depends solely on the number of dvSwitches. If there is only one distributed switch, all the IP traffic flow information from all portgroups in that dvSwitch will be forwarded to one nfcapd. For test purposes, I also deployed both nfdump and nfcapd on a single linux machine but in cases that traffic is high, it maybe a good idea to deploy them on two different machines. Of course nfdump should have access to the storage in that case. Then, daemon will run and listen to the specified port: 23456. If you have configured dvSwitch correctly (by specifying ip address of linux machine and 23456 as port) and activated monitoring on some portgroups in vCenter, this daemon will generate a couple of files in that directory. Filtering in nfdump is also possible, pretty much the same as tcpdump and you can view traffics of interest. You can find more information on nfdump website. 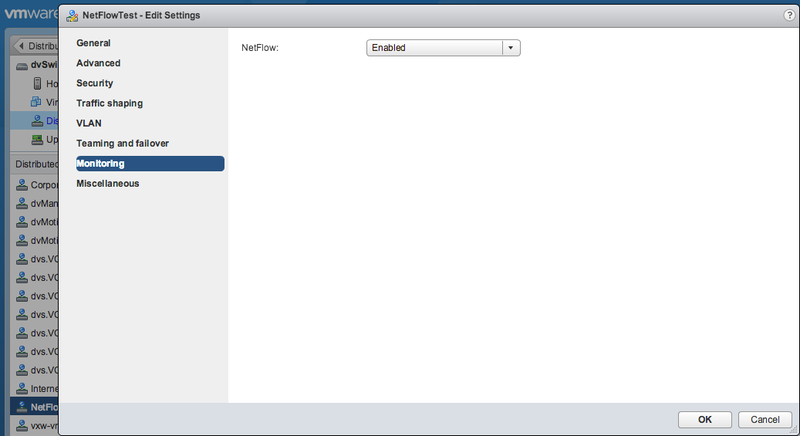 To view NetFlow captured traffic visually, you can mix nfsen with nfdump. It uses information that is dumped by daemon and utilizing rrdtool, it visualizes traffic flow. Installation is not difficult and you can see more information on their website. I’m really satisfied by this beautiful combination of nfdump and nfsen and if you intend to use NetFlow for monitoring, I recommend trying them. Good Luck! Maintaining database server in a VMware environment is crucial. In specific, taking regular backups is really important. Not only it helps in restoring database to a good state in emergency cases, but also it stops oversizing transaction log files. As there would be many transactions in a VMware environment, if you don’t pay attention to transaction log file, you will end up with a huge transaction log file (at least in MS SQL case) or your disk may become full and cause your whole environment to stop functioning. So, it is really important to have a maintenance plan in databases server (MS SQL or Oracle) appropriate for your environment. Of course it may not fix the issue in your case. If it doesn’t help, look into VCD Cells page in cloud administrator console to see if there is an error message that maybe useful. Also, reconnecting vCenter is recommended. p.s – VMware technical support told me to look into vCenter to monitor its CPU and memory usage. That’s a good point to be considered if everything else is okay and it’s not a configuration issue I believe. Also, database server may be slow not being able to return the result of a query in an acceptable time.